Web testing is a way of checking or validating a web application for potential issues before it is deployed into the production environment or made live. 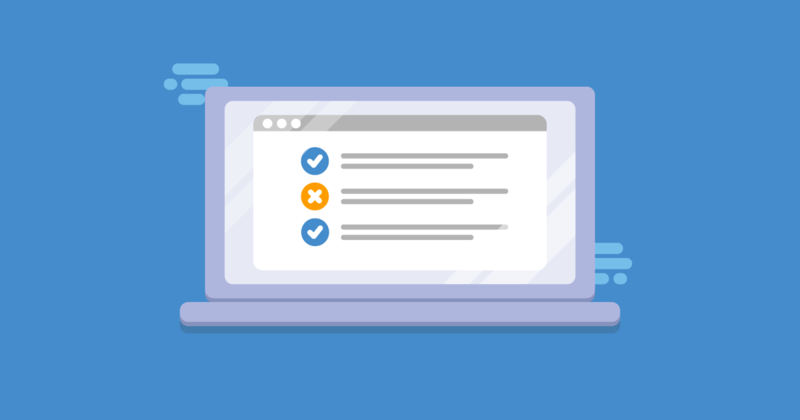 It’s useful to follow a website testing checklist to help log ahead of time everything a tester has to perform to make sure the application is stable and ready to use. Issues such as the web application’s security, proper functioning of the website, and its usability for general users are checked carefully. Here, we are going to provide a solid reckoner that is part knowledge bank, part checklist and part guide. Test that all forms work as intended. Is the input longer than field allows? Does a scrollbar appear if required? Are forms formatted for better readability? Test that cookies function as expected. Cookies are small files in websites, that at their most basic, are designed to remember active user sessions, so the user doesn’t have to login each time they visit the website. What happens if a user deletes their cookies while visiting the site? What happens if a user deletes cookies following a site visit? Test HTML and CSS to ensure that search engine can crawl your website easily. The goal of usability testing is to establish the ease of use and effectiveness of the website. Check our beginners guide to Usability Testing. Test the website navigation and content. Does the web application convey a clear sense of its intended audience? Does the web application have a consistent, clearly recognizable “look-&-feel”? In this testing, three particular areas should be tested: Application, Web, and Database Server. Most importantly, test the system response for when the connection between the three layers above is not established. An appropriate message should be shown to the end user. If plugins are used, can the site still function if they are removed? For any linked documents, are they supported and can you still open them all platforms? If there are failures or errors in a download, can the system respond suitably to the situation? Does the copy and paste functionality work as it should? Test if the application gets crashed, is there any recovery mechanism is in place? Can we use the site without enabling or allowing plugins? If there are documents available or linked within the application, can we download them on the available platforms? If there are crashes or failures, can they recover gracefully? What recovery mechanisms are in place? In this form of testing, we determine whether an application is compatible with other elements of the system. The goal of compatibility testing is to evaluate how well the application performs in a particular browser, operating systems, hardware or software. This ensures that the application under test displays correctly across different platforms. Test the application on different browsers to check the web pages display correctly. You may also want to check for mobile browser compatibility, and compatibility on Firefox, Chrome, Safari, IE. The rendering of elements can be tested by running the application on a number of the various operating systems available. You may check the compatibility on Windows, Linux, Mac etc. Rather than setting up your own devices / browsers, we do recommend at looking at online cross browser testing tools to aid with this work. This kind of testing is performed usually to evaluate the compliance of a system with specified performance requirements as mentioned in the specifications. A database is one of the important components of any web application and it is important to test it thoroughly. Ali is an experienced software tester and has worked with in a variety of areas from e-commerce, healthcare and social networking. re you planning to verify after a website launch? Check this top 5 list of items to include in your website testing checklist for covering the main areas.